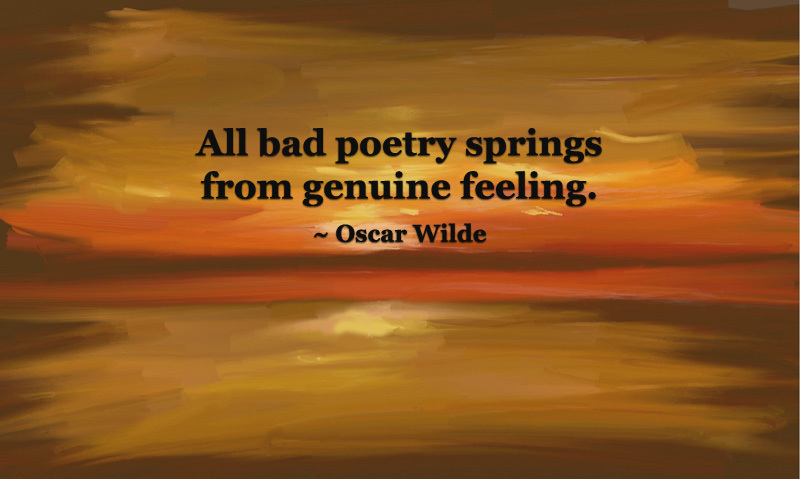 The notion of ‘bad poetry’ has been on my mind since I listened to some last night. it’s even harder for someone to take you seriously if you’re not a good poet yourself. are only interested in sharing their work. on their work or themselves. An insightful post this is for me. I have a book of poetry I am working on and I gave a friend who is also a self publisher to read through it. the next Sunday she sees me and says “I love your poetry, what do you intend to do ………….”, some weeks after we meet again and she asks me about my work and I said “I am almost through, just doing some editing” and she exclaims ” you mean what you gave me was not edited”. then I remembered I did not tell her exactly what I needed from her. poetry means many things to many people and may take endless time to refine, but at a time must be published so the poet be relieved. That’s often the way it is when we ask for help or advice from our friends and family… they do not want to hurt our feelings and so will spare our feelings before being completely honest. I hope the editors you’ve chosen to rely on are compassionate as well as knowledgeable in their field 🙂 Good luck with your book!